Odontogenic Myxoma (OM) is a benign mesenchymal odontogenic tumor included in the heterogeneous group of myxoid lesions. This tumor was identified for the first time in 1947 by Thoma and Goldman , while Stout described OM as a true mesenchymal neoplasm, in 1948 . OM is characterized by stellate and spindle-shaped cells dispersed in an abundant myxoid extracellular matrix. When a greater amount of collagen is evident, the term “odontogenic myxofibroma” may be used . OM is believed to originate from embryonic connective tissue associated with the tooth-bearing apparatus. The evidence for its odontogenic origin arises from several aspects, such as the almost exclusive location in the tooth-bearing areas of the jaws, the occasional association with missing or unerupted teeth, and the possible presence of odontogenic epithelium . Peripheral Odontogenic Myxoma (POM) is considered the extra-osseous counterpart of OM. It is very rare and significantly less aggressive, compared to OM . Furthermore, POM is a slow-growing tumor with a lower recurrence rate than its central counterpart, with no evidence of metastasis. The age range of affected patients is wide, with most of the cases found between the second and fourth decades of life, with an M:F ratio of 2:1 . POM usually presents as painless and exophytic gingival mass, resulting in a slowly-growing swelling. The overlying epithelium is usually unaffected and no bony involvement is present . POM appears macroscopically as a grey-white, mucoid mass with a smooth or multinodular external appearance and it usually is encapsulated or circumscribed . POM may be difficult to differentiate microscopically from other tumors with myxoid features, risking being misdiagnosed with fibroma, peripheral odontogenic fibromas, or oral focal mucinosis. Diagnosis can be established only after histological examination of the lesion [5, 8-10]. Histological features of OM are almost identical to the dental papilla of a developing tooth or a normal dental follicle, and nests of inactive odontogenic epithelium may be present . The aim of this report is to present two new cases of POM and to conduct an extensive and critical review of the English literature, taking into consideration both certain and putative cases of POM. A 47-year-old male was referred to the Department of Maxillofacial Surgery, “Ospedali Riuniti” General Hospital, Ancona, with an asymptomatic large mass located on the right mandible mucosa, in the premolar region. This lesion had appeared 3 months previously and was beginning to interfere with mastication. Oral examination showed a tense-elastic mass measuring about 2-3 cm, with erythematous overlying mucosa (Fig. 1). Radiological examination showed the absence of erosion of the underlying bone (Fig. 2). Preoperative clinical diagnosis was oral fibroma; the lesion was completely excised and the tissue was sent for histological evaluation. Gross examination of the specimen revealed a withe nodule, with elastic consistency, measuring 2.5 x 2 cm. Microscopically, the lesion was characterized by stellate and spindle-shaped cells, embedded in an extensively vascularized fibro-myxoid extracellular matrix (Fig. 3). Scattered nests of inactive odontogenic epithelium surrounded by fibrous stroma were seen (Fig. 4). Neither atypia nor mitotic activity was seen. The mucosa is covered by epithelium-free of atypia, and the connective tissue showed chronic inflammatory infiltrate with hemosiderin iron deposits. Based upon these features, the diagnosis of POM was made. No evidence of recurrence was found after a 7-year follow-up. Fig. (1). Patient 1. Clinical examination showed the presence of erythematous tense-elastic lesion of 2-3 cm on the mucosa of premolar region. Fig. (2). Patient 1. Radiography shows absence of bone erosion. Fig. (3). Peripheral odontogenic myxoma, patient 1. 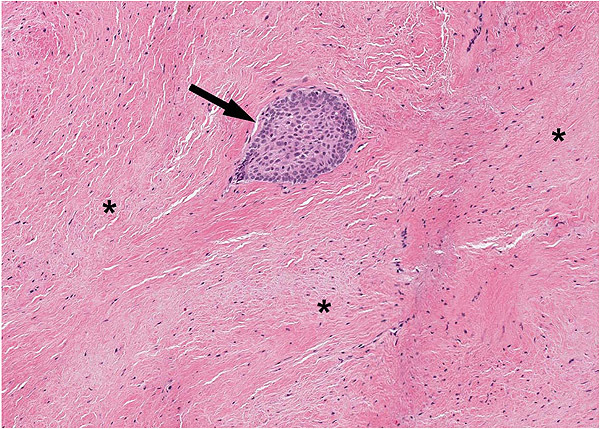 Histological examination showed randomly oriented spindled fibroblastic cells (black arrows) in a well-vascularized myxoid matrix (asterisks). H&E x 20. Fig. (4). Peripheral odontogenic myxoma, patient 1. 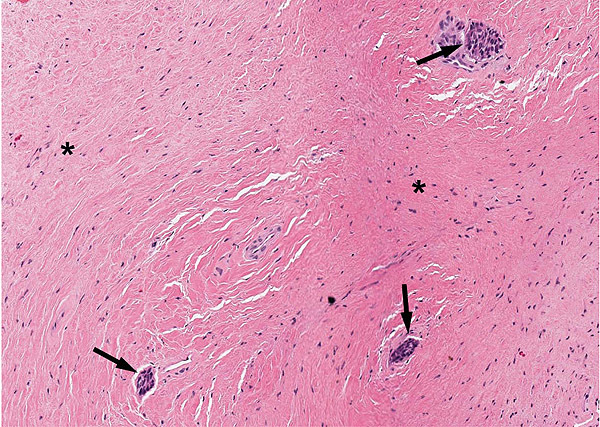 Histological examination showed scattered nests of inactive odontogenic epithelium (black arrows) surrounded by fibrous stroma (asterisks). H&E x 20. The second patient was a 23 year-old male, referred to the Dental Clinic of Marche Polytechnic University, Ancona, with a 1-month history of progressive enlargement of an asymptomatic mass in the anterior right mandible mucosa. Oral examination showed a soft tissue mass measuring about 1 cm, with normal overlying mucosa, in inferior premolar region (Fig. 5). Radiological examination showed the absence of erosion of the underlying bone (Fig. 6). Preoperative clinical diagnosis was oral fibroma; the lesion was completely excised, and the tissue was sent for histological evaluation. Macroscopically, fragile fibrous fragments measuring 0.5 x 1 cm were appreciated. Microscopically, the lesion was similar to that in Case 1; a nest of inactive odontogenic epithelium surrounded by fibrous stroma was seen in Fig. (7). 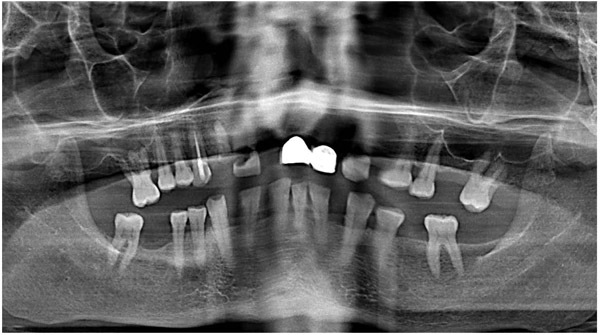 The morphological picture confirmed the diagnosis of peripheral odontogenic myxofibroma. No evidence of recurrence was found after a 9-year follow-up. The term myxoma was first used by Virchow in 1863 to indicate a lesion characterized by stellate and spindle-shaped cells dispersed in an abundant myxoid extracellular matrix . Actually, the term myxoma refers to a large and heterogeneous group of lesions with a different histologic origin that can affect any part of the body . Within this group, in 1947, a new type of myxoid lesion has been identified. This tumor showed a typical involvement of the maxillary bones and was renamed OM by Thoma and Goldman . The peculiarity of myxoid lesions is that a localization in bones other than the jaws is extremely rare, while OM is a relatively common odontogenic tumour [13, 14]. Fig. (5). Patient 2. Clinical examination showed the presence of soft mass of 1 cm on the mucosa of premolar region. Fig. (6). Patient 2. Radiography shows absence of bone erosion. Fig. (7). Peripheral odontogenic myxoma, patient 2. Histological examination showed a large nest of inactive odontogenic epithelium (black arrow) surrounded by fibrous stroma (asterisks). H&E x 20. Since the 1930s, rare variants of odontogenic tumors have been identified, characterized by development in extraosseous position, for this reason, defined peripheral odontogenic tumors . The histogenesis of this rare group of tumors is controversial: It could be derived from remnants of the dental lamina located over the periosteum, in the gingival tissues . The possibility of identifying a peripheral variant of the OM has been debated since the 70s [17, 18], although years before, Pindborg highlighted the difficulty of identifying the histological origin of the so-called “Odontogenic Mesodermal Tumors” . The idea about the possible existence of the POMs has been strengthened over time, and in the last 40 years, several cases of POM have been reported in the literature. Based on that, only the recent cases of POM reported in the literature can be considered “Confirmed”, since the authors were aware of having identified a peripheral variant of OM. Therefore, all case reports before 1975 were considered “Bona fide” POM. To date, a total of 30 cases of POM appeared in the literature, with two more additional cases presented in this article. The main features of POM are summarized in Table 1. The age of the patients ranges from 2 weeks to 71 years, with a peak in the third decade. The tumor shows a higher prevalence in females than males, and the most frequent localization of POM is the anterior maxilla. Table 1. Clinicopathological features of POM cases present in literature. The clinical features of POM are not pathognomonic . Swelling is the most common presenting manifestation, reported in 67.8% of cases, of which 4 cases were associated with other signs and symptoms. Only in 2 cases, the POM was asymptomatic and was discovered as an incidental finding. Other clinical manifestations as tooth mobility, bleeding, generalized gingival hyperplasia and sore throat, were rare. The duration of symptoms varies considerably, ranging from 2 weeks to 30 years. Macroscopically, frequent presentations were a pedunculated mass (31.2%), a soft (31.2%) or a hard mass (25.0%), an erythematous and/or ulcerated mucosa (28.1%). The maximum tumor size ranged from 0.5 to 12 cm, with a mean diameter of 3.2 ± 2.7 cm. Adekeye confirmed the OM's origin from ectomesenchyme , however, POM histogenesis remains uncertain, so several theories have been developed regarding its origin. One hypothesis states that altered primitive fibroblast produces excess mucopolysaccharides. Other authors have suggested an origin derived from mesenchymal cells, such as dental papilla, dental follicle, or periodontal ligament, based on its histological similarity to the stellate reticulum of the developing tooth and its exclusive occurrence in close proximity to the tooth-bearing parts of the jaws . However, further studies are necessary to clarify the origin. The diagnosis of POM is essentially based on the same histological criteria of an OM, differentiating only on the extraosseous position. In fact, these tumors consist of hypocellular lesions composed of randomly oriented stellate, spindle-shaped and round cells with long, fine, anastomosing, pale or slightly eosinophilic cytoplasmic processes. The cells are evenly dispersed in an abundant myxoid ground substance that characteristically contains a minimal amount of collagen fibers. Binucleated cells, mild pleomorphism, and mitotic figures may occur and can mimic atypia. The late recognition of the existence of POM is suggested by the fact that a reference to the existence of this variant appeared only in the last WHO classification of odontogenic tumors . Given the quite specific characteristics of the OM, the recognition of a peripheral variant implies a certain overlap with another lesion: the soft tissue myxoma. In fact, this myxoid lesion can affect any region of the body, including the head and neck region [22, 23]. Based on the characteristics of OM reported in WHO classification, microscopic nests of odontogenic epithelium may be found in about 5% of OM and are not required for establishing histological diagnosis since the use of clinical, radiological and histological data make the diagnosis of OM possible [3, 24]. In this literature review, 9 cases showed the presence of odontogenic epithelium. Diagnostic doubts occur in POM: in fact, a myxoid lesion without nests of odontogenic epithelium that develops in extraosseous position can be misdiagnosed with a soft tissue myxoma. Anatomical criteria are not always sufficient to distinguish these two tumors (e.g. myxomas originating from the cheek mucosa can be considered not of odontogenic origin, as well as other suspected odontogenic tumors ). On the other hand, considering the presence of odontogenic epithelium as an essential diagnostic criterion would exclude several cases that have been classified as POM. Furthermore, this would involve different diagnostic criteria between the central and peripheral variants of the same tumor. Based on the analysis of literature data, it seems that the percentage of POM with odontogenic epithelium is superior to the central counterpart. This difference could be a bias, or it could even further justify the need for a different classification criterion between POM and OM. If left untreated, POMs have unlimited growth potential; a phenomenon which distinguishes POM from reactive non-neoplastic polypoid gingival growths. The treatment of choice is surgical excision, accompanied by extraction of involved teeth in 4 cases. POMs without bone destruction are treated with simple surgical excision, while those with bone destruction require excision and marginal curettage. 24 cases underwent regular postoperative control, with a follow-up period ranging from 4 months to 13 years. Some authors suggested that POM seems to have a much lower recurrence rate than the central counterpart. Therefore, a carefully planned conservative enucleation or semi-radical approach is justified, while other procedures are not recommended . Overtreatment of POMs should be avoided in lesions close to vital structures and in pediatric patients, as it may affect the alignment and eruption of the teeth . Recurrence is usually due to incomplete removal of the tumor and lack of capsule. Therefore, the follow-up period is clearly necessary to rule out intraosseous extension and recurrences. POMs are less aggressive than their central counterparts and only one case reported in the literature have recurred . However, it is recommended to use the same follow-up protocol of OM, consisting in a close monitoring for at least the first 2 years after surgery; a period during which the neoplasm is most likely to recur . Analysis of the literature data, including confirmed and “bona fide” cases, is recapitulated in Table 2. Table 2. Analysis of literature data. In conclusion, very few case reports of POMs are available in the literature. 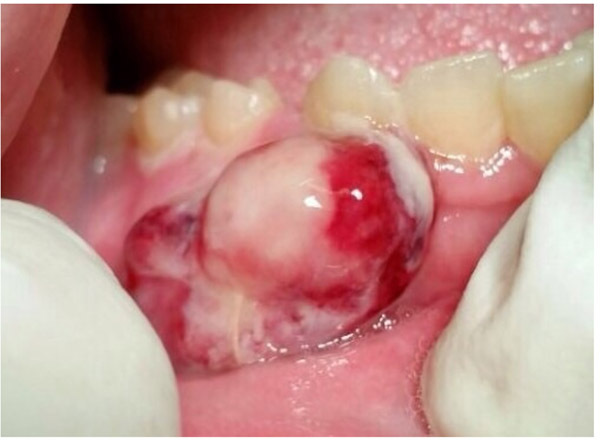 Usually, this tumor presents as an asymptomatic, exophytic gingival mass without bony involvement. Clinically and histologically, POMs resemble many other soft tissue lesions, so they must be diagnosed by histological examination. POM is less aggressive compared to its central counterpart, that must be treated by surgical excision. It shows evidence of recurrence only in one case; however, a follow-up period is recommended. Written informed consent has been obtained from all patients. Marco Mascitti and Andrea Santarelli described the clinical cases. Marco Mascitti and Filippo Pirani conceived the literature review. Lucrezia Togni and Filippo Pirani wrote the manuscript with support from Marco Mascitti. Corrado Rubini and Lucrezia Togni performed histopathological analysis and revisited critically the manuscript. All authors discussed and approved the final version of the manuscript to be published. Thoma KH, Goldman HM. Central myxoma of the jaw. Oral Surg Oral Med Oral Pathol 1947; 33(7): B532-40. Stout AP. Myxoma, the tumor of primitive mesenchyme. Ann Surg 1948; 127(4): 706-19. El-Naggar AK, Chan JKC, Rubin Grandis J, Takata T, Slootweg PJ, Eds. WHO classification of head and neck tumours 2017; 347. Jain VK, Reddy SN. Peripheral odontogenic myxoma of maxillary gingiva: A rare clinical entity. J Indian Soc Periodontol 2013; 17(5): 653-6. Bajpai M, Pardhe N. Extra-Osseous Odontogenic Myxoma of Maxillary Gingiva. J Coll Physicians Surg Pak 2017; 27(3): S28-9. Raubenheimer EJ, Noffke CE. Peripheral odontogenic myxoma: A review of the literature and report of two cases. J Maxillofac Oral Surg 2012; 11(1): 101-4. Shenoy VS, Rao RA, Prasad V, Kamath PM, Rao KS. Soft tissue myxoma: A rare differential diagnosis of localized oral cavity lesions. J Clin Diagn Res 2014; 8(12): KD01-2. Kanitkar S, Kamat M, Tamagond S, Varekar A, Datar U. 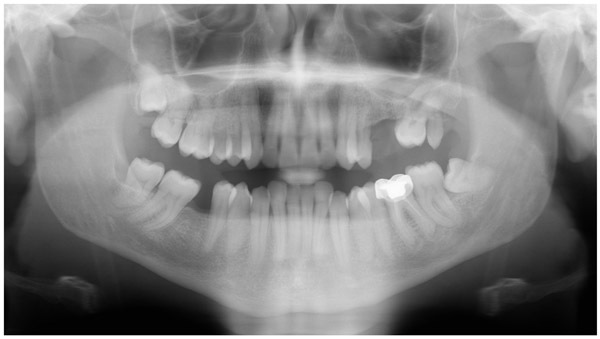 Peripheral odontogenic myxoma in a 12-year-old girl: A rare entity. J Korean Assoc Oral Maxillofac Surg 2017; 43(3): 178-81. Mascitti M, Santarelli A, Zizzi A, Procaccini M, Lo Muzio L, Rubini C. Expression of p73 and TRAIL in odontogenic cysts and tumors. J Oral Sci 2016; 58(4): 459-64. Dutz W, Stout AP. The myxoma in childhood. Cancer 1961; 14: 629-35. Allen PW. Myxoma is not a single entity: A review of the concept of myxoma. Ann Diagn Pathol 2000; 4(2): 99-123. Barnes L, Eveson JW, Reichart P, Sidransky D, Eds. Pathology and genetics of head and neck tumours 2005. Rubini C, Mascitti M, Santarelli A, et al. Odontogenic tumors: A retrospective clinicopathological study from two Italian centers. Pathologica 2017; 109(1): 35-46. Stanley HR Jr, Krogh HW. Peripheral ameloblastoma; Report of a case. Oral Surg Oral Med Oral Pathol 1959; 12(6): 760-5. Manor Y, Mardinger O, Katz J, Taicher S, Hirshberg A. Peripheral odontogenic tumours: Differential diagnosis in gingival lesions. Int J Oral Maxillofac Surg 2004; 33(3): 268-73. Gundlach KK, Schulz A. Odontogenic myxoma: Clinical concept and morphological studies. J Oral Pathol 1977; 6(6): 343-58. Schmidseder R, Groddeck A, Scheunemann H. Diagnostic and therapeutic problems of myxomas (myxofibromas) of the jaws. J Maxillofac Surg 1978; 6(4): 281-6. Pindborg JJ, Clausen F. Classification of odontogenic tumors: A suggestion. Acta odont Scand 1958; 16: 293-301. Epivatianos A, Iordanidis S, Zaraboukas T. Myxoma of the oral soft tissues: Report of a case and literature review. J Oral Maxillofac Surg 2007; 65(2): 317-20. Tasnime S, Saxena C, Bansal V, Wadhwan V. Peripheral odontogenic myxoma. Indian J Dent Res 2016; 27(4): 437-40. Tse JJ, Vander S. The soft tissue myxoma of the head and neck region: Report of a case and literature review. Head Neck Surg 1985; 7(6): 479-83. Andrews T, Kountakis SE, Maillard AA. Myxomas of the head and neck. Am J Otolaryngol 2000; 21(3): 184-9. Santarelli A, Mascitti M, Orsini G, et al. Osteopontin, osteocalcin and OB-cadherin expression in Synthetic nanohydroxyapatite vs bovine hydroxyapatite cultured Osteoblastic-like cells. J Biol Regul Homeost Agents 2014; 28(3): 523-9. Philipsen HP, Reichart PA, Nikai H, Takata T, Kudo Y. Peripheral ameloblastoma: biological profile based on 160 cases from the literature. Oral Oncol 2001; 37(1): 17-27. Schneider LC, Weisinger E. Odontogenic fibromyxoma arising from the periodontal ligament. J Periodontol 1975; 46(8): 493-7. Kapoor P, Gandhewar TM, Andrade NN, Desai RS. 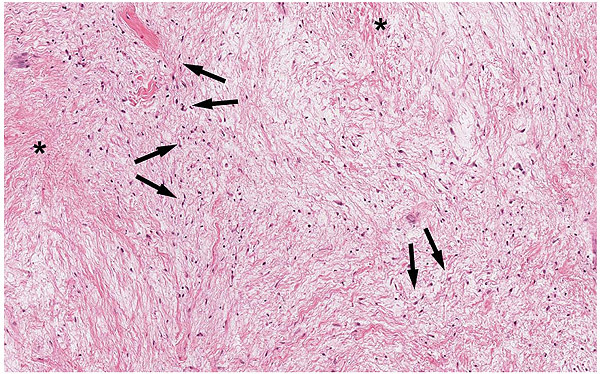 Peripheral myxoma of the infratemporal region: An unusual case report. J Oral Biol Craniofac Res 2015; 5(3): 232-5. Daniels DW. M.B. L. A case of pure myxoma of the lower jaw. Lancet 1908; 172: 1747. Tholen EF. Myxomata of the jaw and pharynx. Trans Am Laryngol Rhinol Otol 1936; 42: 608. Babbit JA, Pfeiffer DB. Myxoma of the palate and pharynx. Arch Otolaryngol 1937; 26: 453. Sealey VT. An unusual tumour on the palate. Aust Dent J 1948; 52(3): 177. Salama N, Hilmy A. Cases from the clinic of the Cairo Dental School. Oral Surg Oral Med Oral Pathol 1951; 4(8): 966-84. Pradhan AC, Varma RK, Pradhan S. Myxoma of the hard palate. Int Surg 1972; 57(4): 341. Tahsinoğlu M, Cöloğlu AS, Kuralay T. Myxoma of the gingiva: A case report. Br J Oral Surg 1975; 13(1): 95-7. Matsumara T, Hasegawa K, Isono K, Kawakatsu K. Congenital fibromyxoma: Report of case. J Oral Surg 1977; 35(4): 313-5. Swart JG, van der Kwast WA, Snow GB, van der Waal I. Possible myxoma of the floor of the mouth: Report of case. J Oral Surg 1977; 35(6): 501-3. Elzay RP, Dutz W. Myxomas of the paraoral: Oral soft tissues. Oral Surg Oral Med Oral Pathol 1978; 45(2): 246-54. Rapidis AD, Triantafyllou AG. Myxoma of the oral soft tissues. J Oral Maxillofac Surg 1983; 41(3): 188-92. Nakano Y, Yamamoto H, Shiozaki H, et al. Peripheral myxoma of the right maxilla: A case and review of the Japanese literature. J Nihon Univ Sch Dent 1985; 27(2): 119-25. Siar CH, Ng KH, Devadas V, Patricia M. Oral soft tissue myxoma. Report of a case. J Oral Med 1986; 41(4): 256-8. Günhan O, Arpak N, Celasun B, Can C. Odontogenic myxoma. Report of a periodontally-located case. J Periodontol 1991; 62(6): 387-9. Quintal MC, Tabet JC, Oligny L, Russo P. Oral soft tissue myxoma: Report of a case and review of the literature. J Otolaryngol 1994; 23(1): 42-5. Shimoyama T, Horie N, Kato T, et al. Soft tissue myxoma of the gingiva: Report of a case and review of the literature of soft tissue myxoma in the oral region. J Oral Sci 2000; 42(2): 107-9. Chang SH, Lee KF, Chan CP, Kuo SB. Myxoma of the gingiva: A case report and literature review. Chang Gung Med J 2001; 24(12): 826-31. Ramaraj PN, Shah SP. Peripheral myxoma of maxilla. A case report. Indian J Dent Res 2003; 14(1): 67-9. Aytac-Yazicioglu D, Eren H, Görgün S. Peripheral odontogenic myxoma located on the maxillary gingiva: Report of a case and review of the literature. Oral Maxillofac Surg 2008; 12(3): 167-71. Nazarov K, Ergun S, Çekici A, Tanyeri H, Ibrahim M, Ișik G. Successful treatment of an odontogenic peripheral myxofibroma using diode laser. J Oral Laser Applications 2008; 8: 117-20. Bhoyar N, Gupta S, Ghosh S. Odontogenic myxofibroma of gingiva in a pediatric patient with tuberous sclerosis: A rare case report. Contemp Clin Dent 2016; 7(4): 558-61.